As promised, I’ve been keeping tabs on our host farms, seeing how they keep busy as they wait for and prepare for Thurman Maple Days. 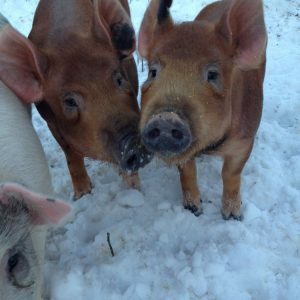 Last week I checked in with Bob and Irene Barody, owners of Blackberry Hill Farm and Sanctuary, a diversified family farm with a big heart for animals in need. Bob sounded a little frustrated. “Winter came early on the farm this year; we had just put our garlic in the ground when we were hit by that early November storm.” The early snow meant that they weren’t able to put up the new building, intended to house a large part of their operation, so they’ll probably have to fit that into their spring schedule. For now, Bob says, their daily routine revolves around heat lamps and dealing with frozen water lines to the barns. But he looks ahead. “Spring is just around the corner and before we know it, our seeds will be arriving and our organic inspection, too.” And in the interim, Bob and Irene look forward to seeing you during Thurman Maple Days when they can tell you about their line of organic poultry products and non-GMO pork from heritage pigs. They may have organic herbs left from last summer.